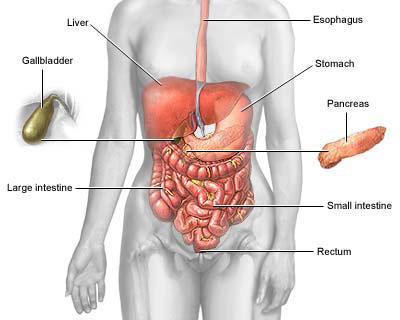 The appendix is attached to the large intestine at the point where the small intestine ends and the colon begins. Appendicitis is an inflammation of the appendix. Inflammation can occur when there is a blockage at the opening of the appendix into the large bowel. This blockage can sometimes be due to stool blocking the opening. When inflammation of the appendix occurs a person may experience certain symptoms.Treatment for appendicitis is surgical removal, or appendectomy, if the inflammation is contained to one area. If the inflammation progresses, the appendix can burst. If the appendix bursts then the infection can spread to the abdomen. If the appendix does burst before surgery, the surgeon may want to treat the infection first and then do surgery at a later time. Prior to the development of minimally invasive surgery, surgeons traditionally performed an open incision and removal of the appendix. This technique required a larger incision to remove the appendix. 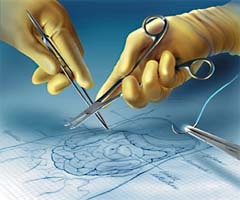 Now patients commonly have a laparoscopic appendectomy, which is one of many minimally invasive procedures allowing the surgeon to perform the same surgery through a smaller incision benefiting the patient with less pain after surgery and a shorter hospital stay.You can expect to have three to four small abdominal incisions after surgery usually covered with a small band-aid. Some patients may have a drain after surgery that nursing staff will teach you how to care for at home. Many patients experience a minimal amount of pain/discomfort after surgery. When cleared by your physician you will be able to get out of bed and walk, begin to start eating, and be discharged home. 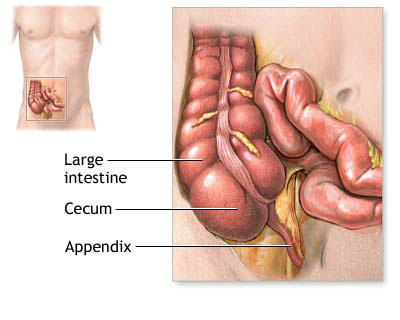 The appendix is a small, finger-shaped pouch of intestinal tissue extending from the cecum, which is the first part of the large intestine. Blockage of the opening of the appendix into the bowel by a hard small stool fragment (fecalith) is believed to be a frequent cause of appendicitis. The infected appendix must be surgically removed (emergency appendectomy), because if it becomes perforated (leaks), this can lead to infection of the entire abdominal space (peritonitis), which can be fatal. The surgery is done while the patient is unconscious and pain-free (using general anesthesia). A small incision is made in the right lower quadrant of the abdomen and the appendix is removed. Alternatively, the appendix may be removed laparoscopically (with a smaller incision, using a tiny camera to visualize the area).If a pocket of infection (abscess) has formed or the appendix has ruptured, the abdomen will be thoroughly washed out during surgery and a small tube may be left in to help drain out fluids or pus. Imaging studies will likely be used. There is no test to confirm appendicitis, and the symptoms may be caused by other illnesses. The health care provider must diagnose the condition based on the information you report and what he or she finds from tests and physical examination. Even if the surgeon finds that the appendix is not infected (which happens up to 25% of the time), he or she will thoroughly check the other abdominal organs and remove the appendix anyway in order to prevent future problems. 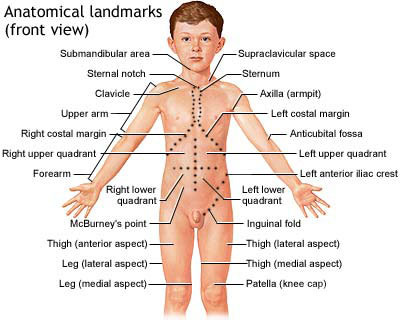 There are three body views (front, back and side) that may be helpful if you are uncertain of a body area. Many areas are referred to by both descriptive and technical names. For example, the back of the knee is called the popliteal fossa. However, areas like the “flank” may not have both names, so the location may be unclear. Browse through a series of illustrations for Appendectomy. Recovery from a simple appendectomy is usually complete and rapid. If the appendix has developed an abscess or ruptured, the recovery will be slower and more complicated, requiring use of medications to treat the infection (antibiotics). Convalescence is usually short and most patients leave the hospital in one to three days after the operation. Normal activities can be resumed within one to three weeks after leaving the hospital. DO seek emergency health care promptly (see your doctor immediately, call 911 or other local emergency number, or get to the emergency room). DO NOT use heating pads, enemas, laxatives, or other home treatment. Finalize health trip for your Otoplasty surgery in India. The ear is more than what we hear with. Then otoplasty surgery in India is the perfect option you are looking for. Plastic surgery of ears can restore proportions. Otoplasty surgery in India can reshape deformed, prominent, or protruding ears. The increasing cost of medical treatment has driven many western patients towards developing countries to look for more alternative options. Thehospitals in India, including the hospitals at Mumbai and Delhi being part of the biggest health care centers provide otoplasty surgery coupled with health trip at low cost. Otoplasty surgeons in India prefer to individualize ear sculpture for each patient’s specific deformity. Otoplasty surgery is typically performed to create or restore the centre fold to disproportionately large or prominent ears. The extent of the procedure depends on what changes are desired and what your surgeon deems appropriate. Otoplasty may be performed under a local anesthetic which numbs the area around the ears or under a general anesthetic which will make you sleep through the entire operation. There are several possible surgical approaches to Otoplasty surgery. Commonly employed technique, the surgeon makes incisions in the back of the ear and removes skin to expose ear cartilage. Then, the surgeon uses sutures to fold the cartilage in on itself to reshape the ear. In some instances, the same result can be achieved without sutures by weakening the cartilage before folding it. By creating a more pronounced fold in the central portion of the ear, the surgeon brings the ear closer to the head. Depending on the extent of the surgery, the procedure usually lasts about one and a half hours. Otoplasty surgery in India by experinced surgeons evaluates patients from around the world and tries to make this process easier with a preliminary remote package that can make patients feel comfortable before traveling to India. Surgeons in India are well qualified to offer various special treatments and care for foreign patients, and give an insight to medical tourism in India on the need to better promote the new trends of health trip at low cost.